In order to use this Web site, become an affiliate, or reseller, you must first complete the registration form. In order to register, users are required to give us contact information (e.g., your name and email address), unique identifiers (e.g., your password), and demographic information (e.g., your zip code) preferences, interests, information relevant to customer surveys and/or offers. Certain information, such as passwords and email addresses, is collected in order to verify your identity and for use in our records. We use this information to contact you about the services or product on our website in which you have expressed interest and communicate with you regarding your order details. If you decide to purchase any of our products or services, Our company will need to collect certain information, such as your billing address. Billing Address that is collected is used to bill you for products and services, and for other purposes. 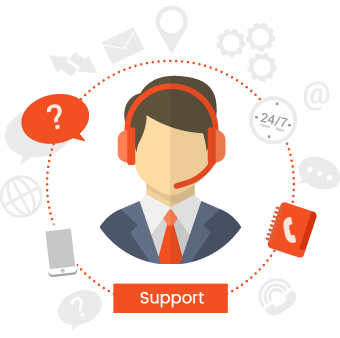 We use the affiliate and reseller information to provide you with an account so that you may manage it online as well as bill you for the services in which you have requested. Only registered Users may purchase a products (themes, plugin, extensions, add-on, or any software module or tools) on our Website. Once you are registered, you have your own account (â€œAccountâ€). You may login to your Account with your username and password. You are responsible for maintaining the security of your password and Account. You are fully responsible for all activities that occur under this Account and any other actions taken in connection with this Account. You must immediately notify Avartan SliderÂ of any unauthorized uses of your Account or any other breaches of security. Avartan SliderÂ will not be liable for any acts or omissions by you, including any damages of any kind incurred as a result of such acts or omissions. During the sign-up process, you may also select the option of receiving e-mail offers from us. You have the obligation to state truthfully, accurately and completely your up-to-date personal information in the registration process and update your account whenever it is needed. If your personal information is not in compliance with these provisions or if Avartan SliderÂ has reasonable suspicions that your personal information is not in accordance with these provisions, Avartan SliderÂ has the rights to reject your application for registration or to suspend or terminate immediately your Account, irrespectively of any notice, any use, current or future. In this case, you have no right to any refund for the suspension or termination of your Account. Avartan SliderÂ is the sole owner of the information collected on this site. Avartan SliderÂ collects personally identifiable information from our visitors or users at several different points on our Web site. We use customer contact information from the registration form to send you our product or services information via email. Unless you ask us not to, we may contact you via email to tell you about specials, new products or services. Your contact information is also used to contact you when necessary for any questions. We may use your IP address to help protect our partners and us from fraud. We partner with third-party advertising networks to either display advertising on our Website or to manage our advertising on other sites. These ad network partners do not collect and do not have access to any personally identifiable information. They may, however, anonymously track your internet usage as per Cookies Policy. Avartan SliderÂ uses website navigation data to operate and improve the Website. Avartan SliderÂ may also use website navigation data alone or in combination with your personal information to provide aggregated information about Avartan Slider. We store all the information that is tracked through standard Google Analytics but we do not save this information on our databases. The security of your personal information is important to us. We follow generally accepted industry standards to protect the personal information submitted to us, both during transmission and once we receive it. Please note that no transmission over the internet can be fully guaranteed in its confidentiality and non-disclosure, and as such, you transmit at your own risk. Only employees who need the information to perform a specific job are granted access to personally identifiable information, such as billing or customer service. The computers and or servers in which we store personally identifiable information are kept in a safe and secure environment. You are responsible for maintaining the security and confidentiality of your Accountâ€™s username and password. We do not make any personal information available to third parties for their marketing purposes. Avartan SliderÂ reserves its right though to share your personal information to a third party in case of sale merger, control change, reorganization or liquidation of the Company. All such actions shall be completed in compliance with applicable laws of personal data and privacy. We never Collect your Credit Card Information and we never store your credit card information to our database. Our Trusted Payment Partner PAYPAL directly process your credit card information with Secure Layer. Avartan SliderÂ is using cookies to improve your experience of our Website. When you visit our Website, Avartan SliderÂ servers send a cookie to your web browser. You can delete these cookies at any time. Standing alone, cookies do not personally identify an individual. Cookies merely recognize the web browser. Session Cookies: If you are using our Services and you choose to identify yourself to us, Avartan SliderÂ uses session cookies containing encrypted information to allow Avartan SliderÂ to uniquely identify you. Each time you log into the Services, a session cookie containing an encrypted, unique identifier that is tied to your account and is placed on your browser. These session cookies allow Avartan SliderÂ to uniquely identify you when you are logged into the Services and download our products and to process online data transactions and requests. Session cookies are required to use the Services. We reserve the right to change these policies from time to time. When we make a change we will update this page of the Website. Any such changes will be effective immediately from the time they are posted.We recommend that you revisit this page from time to time so as to ensure that you are aware of any changes that we have made to these Policies. If you have any questions about this privacy statement or the practices of this site, please contact us at info@avartanslider.com.